After last week’s excitement of installing the bees, most of the week was about watching and waiting. Unlike the first weekend, when it was sunny and warm, the following week was raw and wet. I’m not home during the peak of the day. When I was home early in the morning and early in the evening, there was no sign of the bees outside the hive. I peeked under the top cover every day or so to be sure the feeder was full. They were busy eating so I knew they were in there, but outside the hive it was very quiet. 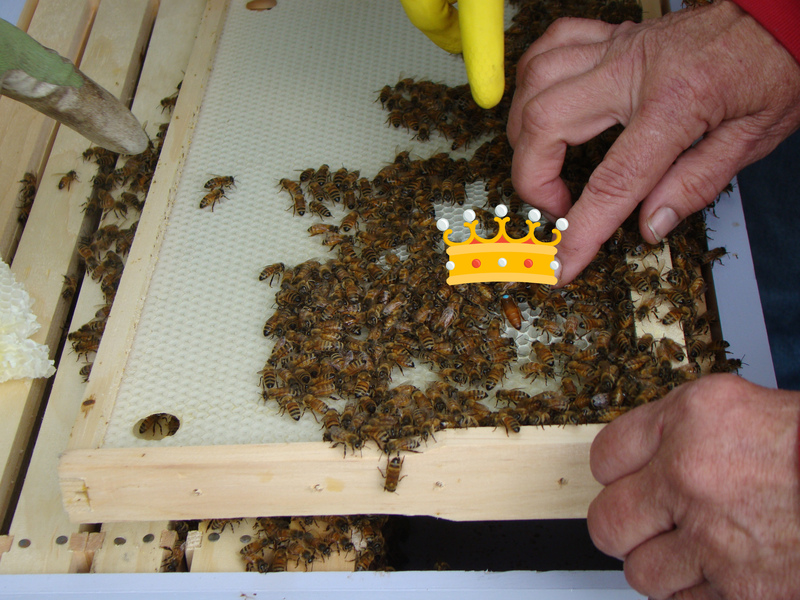 The next big event came towards the end of the week when it was time to open up the hive and check for the queen’s release from her cage. Again, Laury and I did this together. We started at my house. The moment I lifted off the inner cover, I could see that I hadn’t pushed the next frame close enough to the one with the queen cage on it. 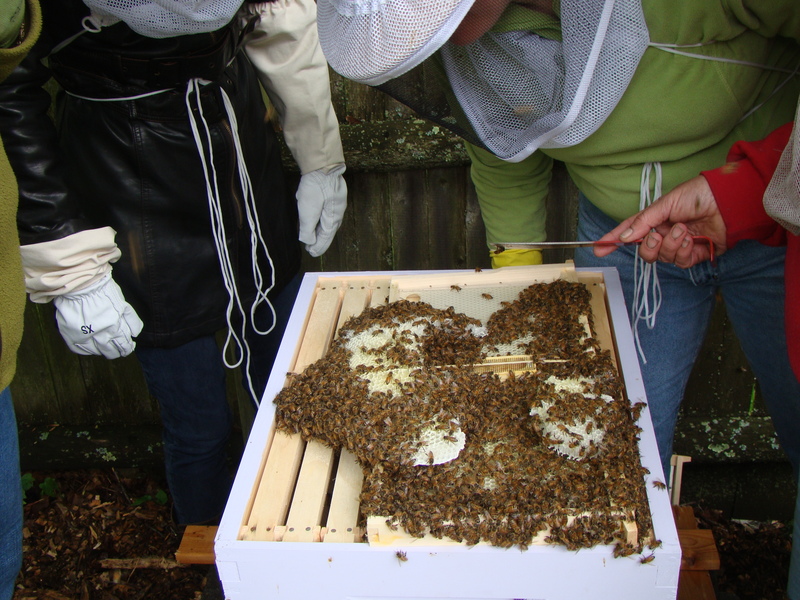 The bees had been very busy building wax comb, but they filled the gap with a new layer of comb. Beeswax covered the queen cage, so I couldn’t see what was what. 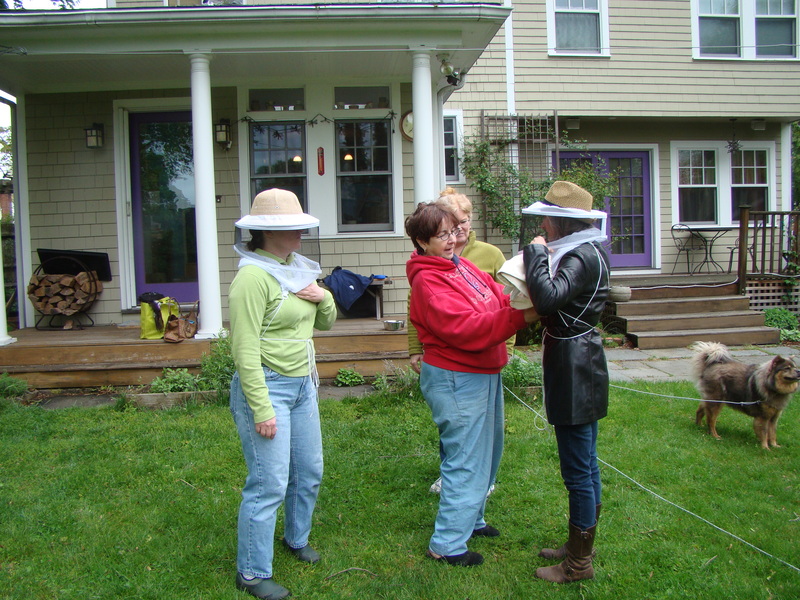 It seemed that the best thing to do was close up the hive and call Nancy, my bee guru. Her store is only open Thursday nights, and though she was there, she was busy, and I was told she’d call back. Next, we went to Laury’s. There, everything looked great. 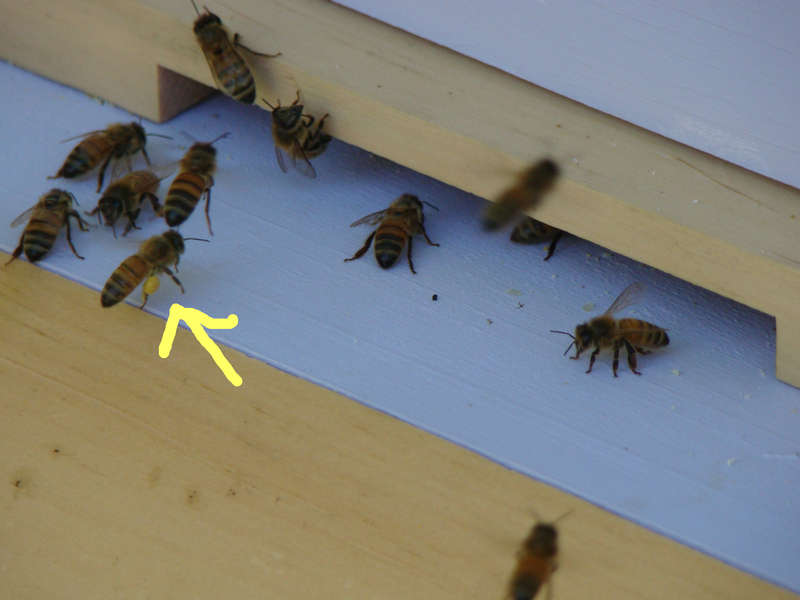 There was some extra spurs of wax buildup (burr comb), but we could easily see that the queen cage was empty. 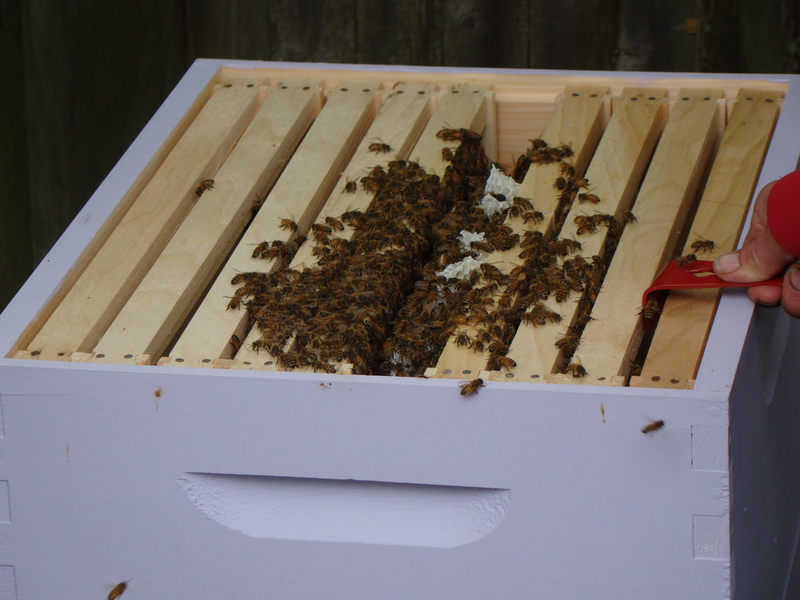 We removed the empty box and the rubber band and admired the bees for a minute or two before closing up her hive. Last stop of the evening was Nancy’s store. It’s not too far from Laury’s house, so we drove over, hoping to get advice about what to do at my hive. The Beekeeper’s Warehouse on a Thursday night is a happening place. The shop was filled with beekeepers buying supplies. As everyone was settling up, Nancy answered a full complement of bee questions. For my issue, she said I needed remedial help (i.e. fixing it was too advanced for a beekeeper of one week), so we scheduled a house call for Saturday. Saturday, Nancy came by. Laury too, and another new beekeeper, Karen. Nancy helped up suit up properly with our veils. Then, we opened the hive. Nancy is such a wonderful teacher. She walked us through each step, encouraging and correcting, teaching us tips and tricks that aren’t as obvious just by reading. The root cause of my extra comb problem was how I had placed the frames. The gap I mentioned left more than the expected bee space, 3/8 inch, that the bees prefer, so they filled it in. Nancy delicately removed the extra layer of beeswax and set it aside. Once the queen cage was exposed, we could see it was empty! Because of the extra disturbance to remove the wax, Nancy wanted to be sure the queen was still at home. This gave her a chance to show us how to properly examine frames. We only needed to look at a couple before we found her. We also confirmed that Queen Lola is laying eggs, right on schedule. The books describe the eggs as looking like a grain of rice standing on end. The eggs are tiny and a bit hard to see until you get used to what it really looks like. I think it more closely resembled an old man’s gray whisker. After that, we put everything back together, with Nancy again teaching and reinforcing proper techniques. The rest of the weekend, as I was weeding the garden (or just standing by observing), my bees were very busy coming and going. The most obvious thing I could see when they returned to the hive was that many of the bees’ pollen baskets were filled to the brim. Pollen is the bee’s major food source for protein. 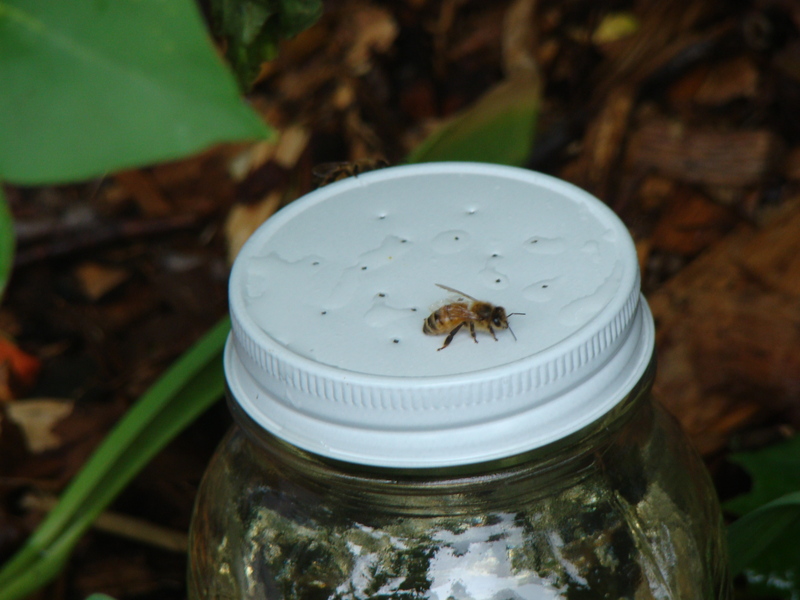 The honeybees have little saddlebags on their legs which they stuff full of it to transport it home. Now, other than checking the feeder, the hive gets left alone for the week, at which point I open it up and check it out again, not to actually do anything for the bees, but to see and learn how things progress within the hive.